To Sum It Up: Willem only got to spend one day in Paris with Lulu, a girl he met first during a Shakespeare performance and then again on a train headed for London, but that single day has left an indelible mark on him. Lulu is gone, presumably back home to the United States, and Willem has almost no way of tracking her down, even though he does try. He attempts to move on and finally returns home to Amsterdam after two years of nonstop traveling, but Amsterdam doesn’t feel much like home anymore. Everything keeps circling back to Lulu and the day that Willem felt more alive than he had in a long time. Even if he never sees her again, which seems likely, he’ll always feel connected to her and remember the impact she's had on his life. 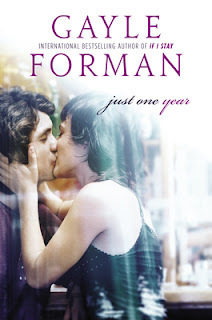 Review: Sometimes you just need a feel-good read, and the double shot of Just One Day and Just One Year has been exactly that. The journey isn’t all sunshine and smiles for sure, but by the end of both novels, there’s an irrepressible sense that if things are meant to be, they’ll find a way of happening, no matter how high the odds are stacked. Yet again, Gayle Forman has worked her magic and made me love contemporary. Just One Year is billed as a companion to Just One Day, and that is an apt description. Just One Year is told from Willem’s perspective this time and picks up with explaining why he failed to return to the Parisian art squat—and to a waiting Allyson, whom he only knows as Lulu. Forman employed a similar narrator swap with If I Stay and Where She Went, and once more, it’s put to effective use. But whereas Adam’s story in Where She Went begins a few years after Mia’s in If I Stay, Willem’s arc runs concurrently with Allyson’s in Just One Day. I highly recommend reading these two books back-to-back; as I read Just One Year, I often thought back to where Allyson was at different points on the shared timeline. It was particularly poignant to see how they could be thousands of miles apart, sometimes on opposite ends of the world, yet experiencing the same emotions. Willem’s backstory gets filled in here, and what emerges is a portrait of a lost young man, still strongly feeling the loss of his father and unable to find comfort from his mother, with whom he’s always had a distant relationship. But, just as that one day in Paris together forever changed Allyson, so too has it altered the course of Willem’s life. Slowly he begins to discover direction, where previously there had been none. I especially loved watching him reconnect with some old friends in Amsterdam; they even help him search for Lulu, despite having so little information at hand. As the novel goes on, Willem’s circle of friends and family widens, and he starts to realize that he’s not so alone. As they did in Just One Day, Shakespeare’s works play a significant role here. I’ve always been more of a tragedy aficionado, but reading Just One Day and Just One Year has definitely piqued my interest in Shakespeare's As You Like It. Even without being familiar with the latter, the lines that are quoted here just feel so fitting; that’s how powerfully this story is conveyed on its own. I’d love to reread both books someday after reading As You Like It; I have a very good feeling that I’ll only love the two more than I already do. All in All: This is an absolute must-read if you read Just One Day, and again, I highly recommend reading the books one after the other if possible. Although Allyson’s story resonated more with me just because we share quite a few personality traits, I still found Willem’s tale compelling and brilliantly told. Gayle Forman has such a knack for writing about love but without making it saccharine, and that is why I keep returning to her novels whenever I need a good dose of contemporary. Hahaha, I hit my limit with QoS, too! I seriously can't handle another read that's going to yank out my heart, shred it, and then take a bulldozer to the remains. Maybe it's good that The Raven King got pushed back to early next year, then, LOL! Man, I am SERIOUSLY missing out here it seems^^ It bugs me really because it's not that I don't WANT to read Contemporary, I just feel like the urge so very seldom strikes me to pick up those kinds of books. I'm such a mood reader that I do need to be drawn to that type of read if I want to enjoy it fully....the pull for fantasy or sci-fi is always so much stronger XD Loved your review and I WILL check out some Gayle Forman soon!